Softcover. 1st pub. 2015 as an eBook. Will Jack the Ripper ever be identified? The answer from the author is an emphatic "No".Jack the Ripper did not exist - except within the minds of his creators and those who for one reason or another have strived for over a century to make the myth a reality. The author exposes the endless stream of lies, invention, political misinformation, self-publicity and opportunism which has kept this Victorian bogeyman alive in the darkest reaches of our 21st century imagination. With References + Index. 570pp. trade size softcover. Cover design by Thomas Lee. 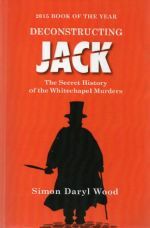 The author was a contributor to the Grey House Books publication 'Who Was Jack the Ripper? A Collection of Present-Day Theories and Observations' pub. in 1995 and still available from Loretta Lay Books. The fr. cover has a vertical crease across the lower corner with similar corresponding crease to fep o/w Vg. A fairly heavy book which will require additional postage if shipped overseas.